The Advantage Urinal Systems ( MALE COMFORT DESIGN ) just developed this year, has a foam ring around the opening of the urinal to provide comfort when the urinal is positioned. This reduces the risk of skin breakdown associated with a urinal that is left in place for any length of time. 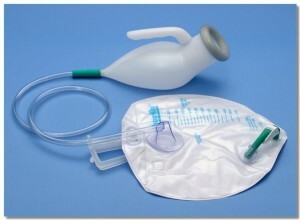 The foam is made of closed-cell, non-absorbent polyethylene, which is durable and easy to clean.